My foreign friends often ask me how Chinese young people make so much money. To answer that question, I spent an entire evening watching a young girl live broadcast her makeup removing process. I was not the only one. There were hundreds of people watching her. The 20-something university student actively interacted with her fans while slowly removing her makeup. "Only by removing your makeup properly, can you help maintain your skin," she told her viewers. She could not see them; but they could send messages to her and ask her all kinds of questions, such as where she is from and what her hobby is. The only thing that didn't make sense was that the majority of her viewers were men. If they like her, they can click the like button and send her cash or a gift online. By showing off her bare face, which she said was more beautiful without makeup, she earned thousands of yuan from her male fans. 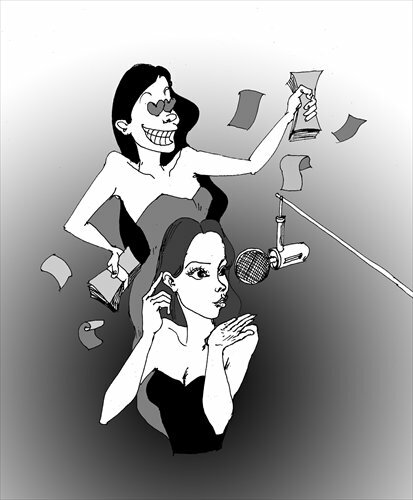 Nowadays, live broadcasting is a new way to make money among young people in China. Similar to live streaming apps, such as Meerkat and Periscope in the US, online live-broadcasting channels are used by Chinese youth to air live broadcasts of themselves eating, talking, singing, dancing and working out. Never heard of them? Ask your kids. Here are some successful examples: a 14-year-old Korean boy who televises himself eating dinner every day reportedly earned about $1,700 for his most successful show, according to the Associated Press. A 20-year-old Chinese girl earns about 30,000 yuan a month, six times higher than the average income of a university graduate, by singing and talking to her fans, according to Channel News Asia. Who are the people doing these performances? They are mostly university students like the girl I watched, who broadcast from her dorm with her roommate sitting in the back, and young people who are between jobs. Some are concerned that doing such shows might have a negative impact on their future job hunting, yet say it is easier to make money live broadcasting than with a full-time job. Still, I don't understand why it is becoming increasingly popular in China. Let's look at two numbers. First, according to an iResearch report in 2014, male viewers of live-broadcasting platforms outnumber female viewers four to one. Second, the number of single men in China is expected to reach 30 million by 2020, according to the National Statistic Bureau. I guess it is not easy for guys to approach a hot girl in real life. Online, they can hide themselves and use cash to get her attention. In return, she would say "thank you" and sing and dance for them. It is not the money that matters to them. They probably all know it is just a show, yet it helps build a "relationship" between remote and lonely people and performers. Another thing that makes live broadcasting so popular is China has over 1 billion mobile phone users. Everyone seems to be online all the time. As long as you have a cell phone and Wi-Fi and, of course, a pretty face, you can turn yourself into an online celebrity anytime anywhere you want.